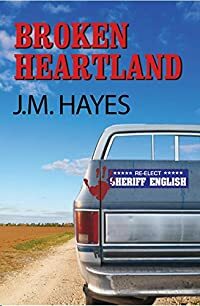 Broken Heartland by J. M. Hayes, a Mysterious Review. Just before dawn, an automobile accident involving a police car and a school bus filled with children who have (supposedly) been rehearsing for the local church choir at a church camp takes place. It's also election day, so the area is crowded with pollsters and voters who are questioning the sheriff's secretary about anything and everything, so much so that she has a hard time answering the telephone and keeping the office available for important calls … like information on the collision of a police car and school bus. There's a fifteen year old boy on a rampage with his father's gun. He has already killed his parents and is now killing fellow students. There's a mad doctor, with hired gunmen, in town to bring in healthy people for transplants in order to keep an aging televangelist alive. Sheriff English's daughters, both named Heather and his brother, Mad Dog, have premonitions that Englishman's life is in danger. Mad Dog drives in from the Black Hills, and both girls leave their respective colleges and drive home, too. With all the unruliness and confusion going on that eventful day, it's difficult to say just who needed whom. Special thanks to guest reviewer Betty of The Betz Review for contributing her review of Broken Heartland. Acknowledgment: Poisoned Pen Press provided an ARC of Broken Heartland for this review.